Mantua Reservoir is located in Sardine Canyon near Mantua, Utah. It sits at an elevation of 5,000 feet and is a popular recreation area for fishing, boating, and water recreation. Brigham City collected samples at the reservoir on July 19, 2018, and Utah Water Watch collected a sample on July 26, 2018. While the July 19, 2018, samples were below the recreation health-based threshold for a Warning Advisory for toxins and cell concentration, the bloom appeared to be growing. Bloom growth was confirmed by the July 26, 2018, sample, which showed an almost fourfold increase in cell-count densities from the week before. Cyanobacteria cell-count concentrations from the later sample exceeded the recreation health-based threshold for a Warning Advisory. Brigham City staff collected a sample above the dam on Mantua Reservoir on June 26, 2018. Toxin strip test results were non-detect for anatoxin-a and between 1 and 2.5 micrograms per liter (µg/L) for microcystins. These toxin concentrations are below the recommended recreational health-based thresholds. Water samples were collected above the dam and the northwest shore at Mantua Reservoir on June 11, 2018. Toxin test strip results were non-detect for microcystin and anatoxin-a for both samples. 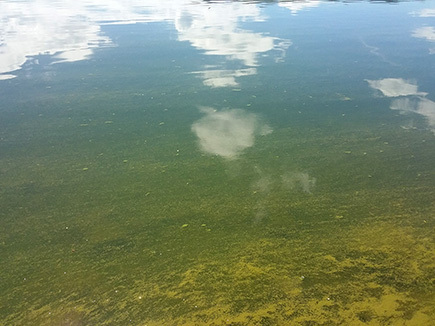 Toxigenic cyanobacteria cell-count concentrations were low, with 767 cells per milliliter (cells/ml) above the dam and 336 cells/ml at the northwest shore. The Division of Water Quality (DWQ) will conduct follow-up sampling at the reservoir early next week. Microcystins were detected in all six samples collected on Mantua Reservoir on May 30, 2018, according to enzyme-linked immunosorbent assay (ELISA) test results from the Utah Department of Agriculture and Food (UDAF) lab. With the exception of the northwest shore location, all samples were below the recommended health threshold of 4 micrograms per liter (µg/L). The northwest shore sample was >5 µg/L, which exceeds the recommended health threshold under Utah Department of Health/Utah Department of Environmental Quality health guidance for cyanotoxins. This sample was also assessed for cyanobacteria cell-count concentrations and general identification. These test results showed the sample contained >2.3 million cells per milliliter (cells/ml). This cell-count density exceeds the recommended health threshold under Utah Department of Health/Utah Department of Environmental Quality health guidance for cell-count concentrations. 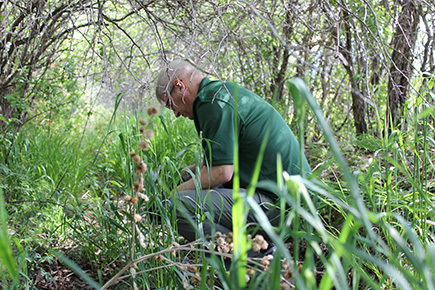 The estimated extent of the localized bloom on the northwest shore was approximately 40 square feet. This localized bloom consists of Dolichospermum spp. 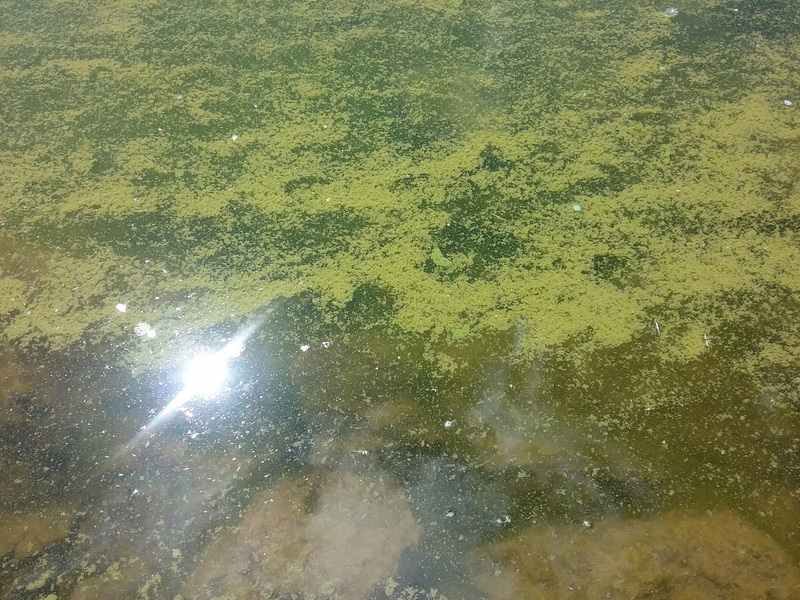 Microcystis spp., and Aphanizomenon cyanobacteria, with Dolichospermum spp. dominating the bloom composition. Samples were collected at the following locations on Mantua Reservoir. Toxin test results are shown for all six sample sites, and cyanobacteria cell-count concentrations are shown for the northwest shore sample site. DWQ will continue to monitor this bloom and provide additional information to the public and local officials as it becomes available.